1976 presidential election results. 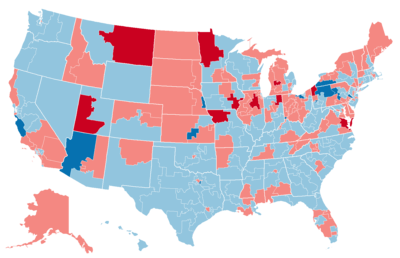 Red denotes states won by Ford, blue denotes states won by Carter. Numbers indicate the electoral votes won by each candidate. Democratic Governor Jimmy Carter of Georgia defeated Republican incumbent President Gerald Ford. 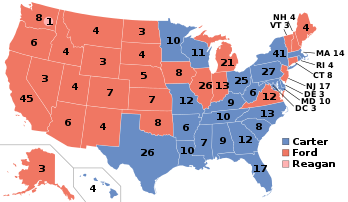 Carter won the popular vote by two points and finished with 297 electoral votes, taking a mix of Southern and Northern states. Ford, who had taken office after the Watergate scandal led to the resignation of Republican President Richard Nixon in 1974, defeated California Governor Ronald Reagan to take the Republican nomination. The convention nominated Kansas Senator Bob Dole as Ford's running mate, instead of sitting Vice President Nelson Rockefeller. Carter defeated a slew of competitors in the 1976 Democratic primaries, including California Governor Jerry Brown, Alabama Governor George Wallace, Arizona Congressman Mo Udall, Washington Senator Henry M. Jackson, and Idaho Senator Frank Church. Neither the House nor Senate saw major changes in partisan composition, so the Democrats retained control of Congress. In the gubernatorial elections, the Democratic Party picked up one seat. ^ "Statistics of the Presidential and Congressional Election of November 2, 1976" (PDF). U.S. House of Reps, Office of the Clerk. Retrieved 10 April 2017. ^ "1976 Presidential Election". US Elections. University of Connecticut. Retrieved 13 August 2011. "1976 Presidential Election". The American Presidency Project. Retrieved 19 June 2017. This American elections-related article is a stub. You can help Wikipedia by expanding it.